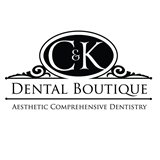 C&K Dental Boutique (Staten Island) - Book Appointment Online! Wow! This is why I love Using Zocdoc! The staff was extremely courteous and professional. The dental hygienist and Dr were also very sweet. You don't feel rushed at all. They explain everything they are going to do and they give you all your options. After having my cleaning not only did they give me a nice hot towel for my mouth (very spa like), but there is also free Chapstick which you tend to need after that! I highly recommend Dr. Cicero's office.